The Institute of Liver and Biliary Sciences (ILBS) has a University status which aims to become an international centre of excellence for the prevention and cure, advance competency-based training and cutting edge research in liver, biliary and allied sciences. ISTH is a global organisation advancing the understanding, prevention, diagnosis and treatment of thrombotic and bleeding disorders. 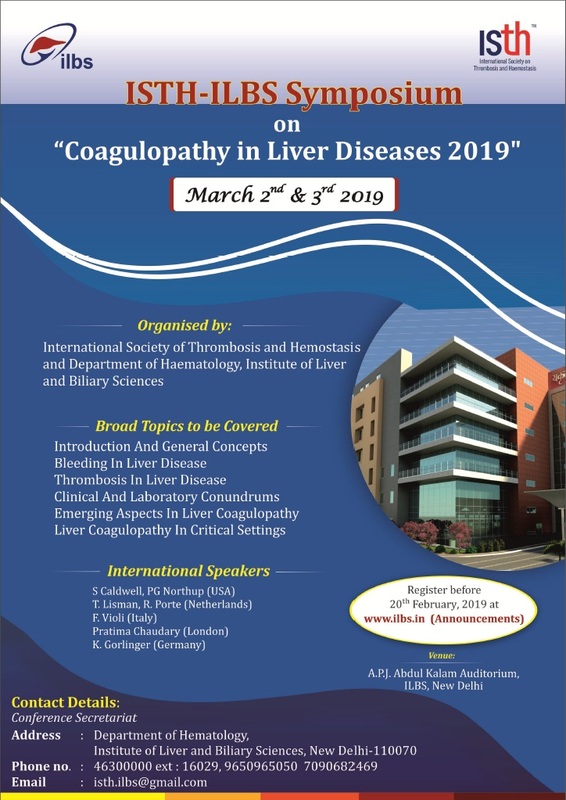 This symposium will be a joint effort of Institute of Liver and Biliary Sciences in close collaboration with International Society of Thrombosis and Haemostasis (ISTH). This symposium aims to focus on the most recent development in pathophysiology, diagnosis and clinical management of hemostatic complications, thrombotic disorders, platelet disorders in patients with liver disease. The symposium would be beneficial for Clinical hematologists, Hepatologists, Anaesthetist, Critical care specialist, transplant surgeon, Pathology students and basic scientists.